The duties of each taxof opiatelike is the timely payment of taxes and fees. The Federal tax service informs citizens about the accrued payments, in accordance with applicable Russian Federation tax laws, sending notice at the end of the reporting period. But there is another way of obtaining such information. 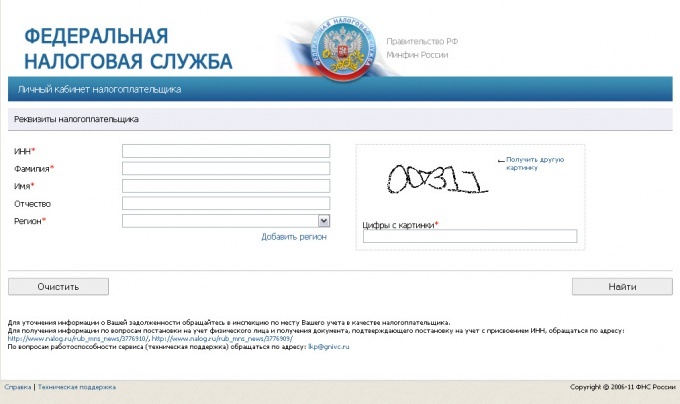 FNS the Russian Federation has placed on its website a convenient service that allows you to know of the tax payable and generate payment documents. 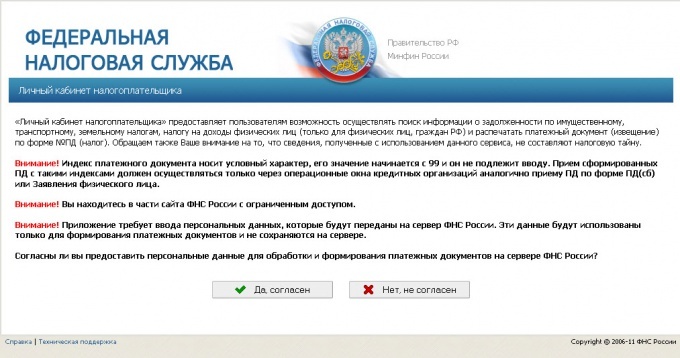 Go to the website of the Federal tax service of Russia and take advantage of the information system in accordance with the status of the taxpayer. This can be addressed to individual entrepreneurs, legal or physical entities. Information about tax debt posted only for individuals. to access it click on the tab "e-services" on the home page. 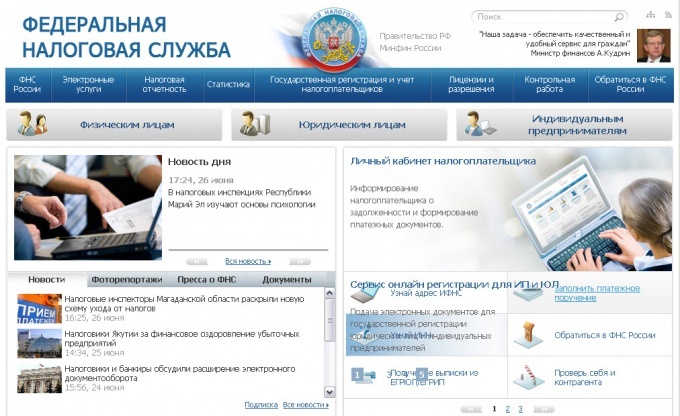 Find it in the list of services the item "Personal Cabinet of the taxpayer". In the opened window click the button confirming agreement to the processing of your personal data. 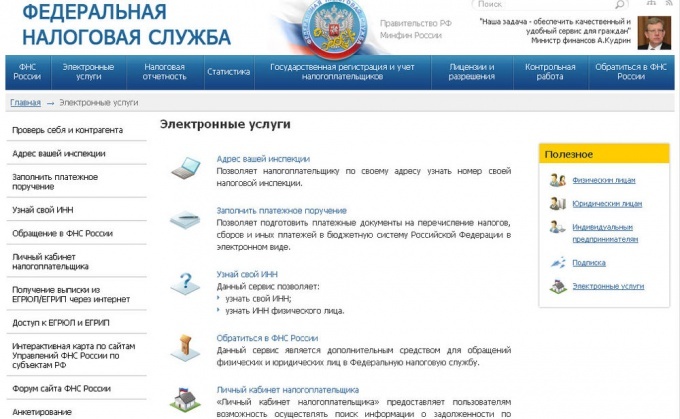 This will allow the service to access protected information the Federal tax service of Russia. Fill in the details of the taxpayer when entering into the active field your personal data (TIN, name, and region). In addition, you will need to write in a special line code shown in the picture. Click "Find" to navigate to your personal data stored in the personal Cabinet of the taxpayer. The system will choose all of your tax debts and penalties on late payments. On your personal page shows the assessed taxes and levies payable to the budgets of different levels. For the convenience of users it provides automatic generation of payment documents with details filled by the recipient for cash. For cashless transfer of funds, you can use the electronic payment system of the savings Bank of the Russian Federation. To clarify questions about charges, contact the tax office responsible for the data calculations. To do this, click "Contact IRS number" in the corresponding row. Here you can make online request and send it for review in the indicated IFNS.